What was your greatest challenge in starting your company Murbles? I had been a business manager and a district manager for 20 years so the business operation was not difficult. The challenge has been branding a product with a name that no one has ever heard of! I would go to a show as a vender and hear “What the hell is a Murble”? Or I would hear “Did you misspell marble”? Do you more often win or lose when you play? Well, I have been playing Murbles for around 30 years now so I do have an edge on most people. I have learned a few tricks and techniques over the years. But with that said, any player will have a 50/50 chance of scoring in any round of play. You see the terrain has a lot to do with how the ball reacts and where they will end up in relation to the point ball. Plus, any player can and often will hit a game ball or the point ball and move it! But to answer your question, I made the game so that I could win! Actually, anyone can win. You discussed with me where you see Murbles in a few years and how you want it to be established enough for your kids and grandchildren. Out of your family, is there anyone who is particularly good at Murbles? Well this is a tough question to answer. All of my family members have Murbles and seem to truly love the game. I will have to give this question more thought. But I am sure several of them could pick up the reins and run with it. What is the most applicable experience you had from your past jobs that helped you create Murbles? When I was 19 years I worked in a machine shop as an apprentice machinist. I was in the navy from 1971 to 1975 and came back to work in the machine shop for 13 years. I became their resident engineer and new product developer. I found that I had a knack for for creating and making things better. Over the past 15 years I feel as though Ultimate Frisbee has become vastly more popular, even being implemented in high schools near my area (as a club sport), do you see this being a potential future for Murbles? Well, The game was designed so anyone could play and anyone win. With that in mind; think about little undersized Johnny who doesn't get picked for a team in any sport by his peers. Johnny has little chance of participating, let alone winning…. but with Murbles, little Johnny can play and can win. So I see Murbles as a great starter game for kids to play. Murbles does not require any special skills to play and win! 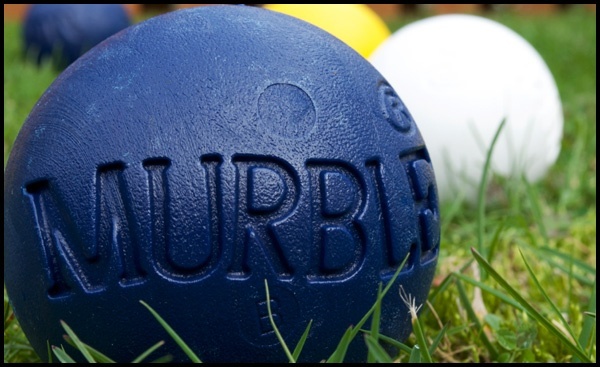 Murbles can offer the same thing for the physically impaired, young and old. Most outdoor activities and games require dedication, repetition, practice and lots of patients to get good at wherever the game is. Murbles is different. It was designed to be played and enjoyed by the whole family, both young and old. Do you have any advice for any young entrepreneurs looking to create their own product? Sure, Develop a good idea and follow it through. I had the opportunity to do a short Q & A with Murray Kramer of Murbles. Murbles recently funded their second co-op with Kickfurther. I have included a link that helps you create your account on Kickfurther. By creating an account with this link you'll recieve 5 dollars to find great companies like Murbles! If you have any questions please feel free to email me at keeton@kickfurther.com. Cheers!